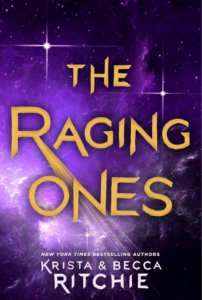 The Raging Ones – Review!!! The year is 3525 on a harsh, frozen planet where society is divided into a type of caste system based on how long you will live. How is this possible, you ask? Well, in this world, every baby has a simple test performed that tells the exact day they are going to die. As you can imagine, this extinguishes plenty of fear in the world because you can take risks and know that you will not die from them (unless it is your death day). However, it also extinguishes a lot of hope as well since you know it can never be changed. People accept the social structure and focus more on just surviving in such a severe environment. The story focuses on three main characters and we follow each of their perspectives along the way. There is Franny Bluecastle, an impulsive and hard-edged Fast Tracker (death days between the ages of 13 – 29) girl who we first meet the day before her impending death day. Court Icecastle is a tough, well-educated ‘thief’ who has a hidden and mysterious past. Lastly, Mykal Kickfall, who is a sweet baby cinnamon roll who hails from the North and was a hunter/warrior prior to falling in with Court. Court and Mykal are drawn to Franny just after she survives her death day and the drama takes off from there. Our three main characters are linked, you discover this early on, not just in the fact that they are the only known individuals to ‘survive’ their death days but also mentally and physically. They have a bond that is unlike anything I have ever read before. It is hard to describe because it is really more of a feeling than anything – they share senses, quite literally. I know what you’re thinking…two boys, one girl, classic set up for a love triangle. Nope. Stop right there. This is NOT that book. This is not who will she choose, who will he choose. There is LOVE but not THAT kind of love. The foundation of this relationship is M/M. Mykal and Court have an incredibly deep, unbreakable bond that goes beyond anything that you would typically find in a ‘romance’ story. Franny does become a part of this but not in a third wheel, add-on, aggressive sort of way. The dynamic between the three is equal and all-consuming and I (a non-romantic) absolutely cherished every moment of it. As a trio, Franny, Mykal and Court enroll to compete for the chance to become employed by StarDust (think NASA meets NSA) and hopefully get one of 5-coveted slots for the Saga-5 Mission. Essentially a space mission, the first in this society for over 300-years. Franny, Mykal and Court make it through enrollment and become three of 1,024 people competing for these spots. They live in dormitories, they have rivalries, they compete in challenges and undergo training on flying space ships, surviving in zero-G environments, etc. This part of the story gave me life! I absolutely love competition/training elements in books – it is one of my all time favorite tropes in YA and this one was so well done. We meet a great cast of side characters and learn more about the world overall through their interactions with our MCs. I am a big fan of science-fiction books and particularly YA-scifi. I read a lot of them. This one impressed me because it felt very true to the genre without weighing you down in science jargon that would make the story unattractive to the masses. They kept the mysterious, dark, smart scifi feel without making it too snobby nerdy -does this make sense? I mean, I am a nerd, I will be the first to admit that, but I like my scifi to have the power to enthrall all types of people – nerd or not. I loved so many things about this book, I know as soon as I publish this review I will think of 50 more things I should have mentioned. This storyline to me was so unique and the characters were so well fleshed out, I am going to be thinking about this one for a long time to come. Which makes me think…how long until the next book? That ending…honestly, I don’t know how I am going to live with this cliffhanger! It blew my mind the end of this book. I cannot wait for my book friends to read this so I can discuss with somebody! Please let that be you – If you haven’t already, please add this book to your TBR – you won’t regret it! These authors, Krista and Becca (identical twins by the way – how cool is that?) deserve a big round of applause! That they came up with this, through a collaboration, is just so significant and I think demonstrative of their level of talent. I am really looking forward to progressing with this series! Thank you so much to Wednesday Books for providing me with an early review copy of this book. It is, so far, my favorite read of 2018 and I just had such a wonderful time with it and providing my thoughts and opinions. I appreciate the opportunity!